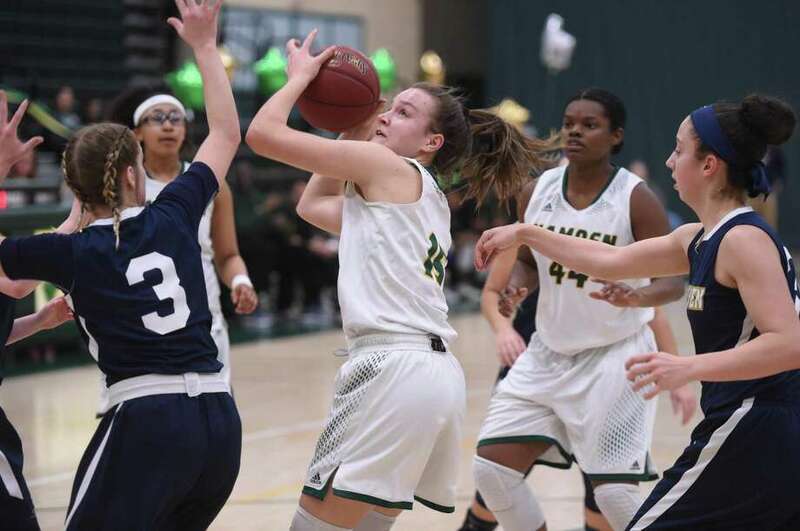 Action from the East Haven vs. Hamden girls basketball game at Hamden High School on February 5, 2019. With under a minute to play in the third, East Haven had stormed all the way back, tying the game. Hamden’s response, opening the fourth quarter on an 8-2 run, told Dragons coach Amanda Forcucci all she needed to know about her team. The No. 6 Dragons pulled away in the fourth and then held on, beating No. 5 East Haven 60-56. It was the first league loss for East Haven, snapping its 12-game winning streak. The win by Hamden denied East Haven the No. 1 seed in the upcoming SCC tournament, though the Yellow Jackets can still claim the top spot if they win out. Hamden (16-2) dominated the offensive backboards, picking up rebound after rebound and getting follow-up baskets. In the third quarter, East Haven went to a 2-3 zone, slowing down Hamden and forcing outside shots, allowing the Yellow Jackets to get back in the game. East Haven (15-3) was led by 26 points from Taylor Salato and 25 from Makenzie Helms. In the fourth quarter, Thompson and fellow senior Makaela Johnson took over for the Dragons. Taniyah Thompson, Hamden: Thompson was on fire, scoring a game-high 26 points, including seven in the fourth quarter.